Look, I have a problem. And the first step is admitting you have a problem… it’s the cardamom, man. I just can’t help myself. I go through ridiculous amount of cardamom. But it’s oh so good. And this bread? Wow. this cardamom cranberry bread is next level. I’ve posted recipes with cardamom before, like my cardamom coconut cranberry granola, my granola topped cardamom peach crisp, my oatmeal cookies with a twist, my hot date granola, and my red wine poached pears. Maybe my problem runs deeper than I thought. (insert grimace emoji!) I just love it okay?!! Regardless, I’ve been baking this bread for quite a while and it’s a huge hit with my kids, and everyone else who tries it. 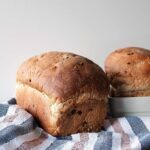 I figured since my best bread machine recipe is one of my most popular blog posts, that you guys would like this recipe too! I usually make this bread completely in my breadmaker, but this time, I wanted a double batch, so I made the 2.5 lb dough in my bread maker on the dough cycle and then punched it down, shaped it and transferred it to loaf pans. To be fair, I could have probably gotten 3 loaves, but I rolled the dice on two. I’m glad it didn’t spill over! This bread is fantastic plain with butter, as toast, and even with turkey sandwiches. It’s so popular in this house, every time my kids see me prepping the bread maker they ask for the cranberry bread! I hope you enjoy it as much we do! Cardamom is a member of the ginger family! I didn’t either! Cardamom is traditionally used in Middle Eastern and Indian kitchens but is gaining world wide popularity. Behind vanilla and saffron, cardamom is one of the world’s most expensive spices! It is believed that cardamom has mood-elevating properties, which might explain my love for it! I throw everything in the bread machine all at one time, instead of adding the dried cranberries to the dispenser compartment – I find this gives a better dispersion of the fruit. The first recipe listed is for a 2 lb loaf, and the second for a 2.5 lb loaf – please double check the capacity of your bread maker! I always over quote on the water, because I live in dry Alberta. You may not need as much water, but as always, bread making is kind of a science. 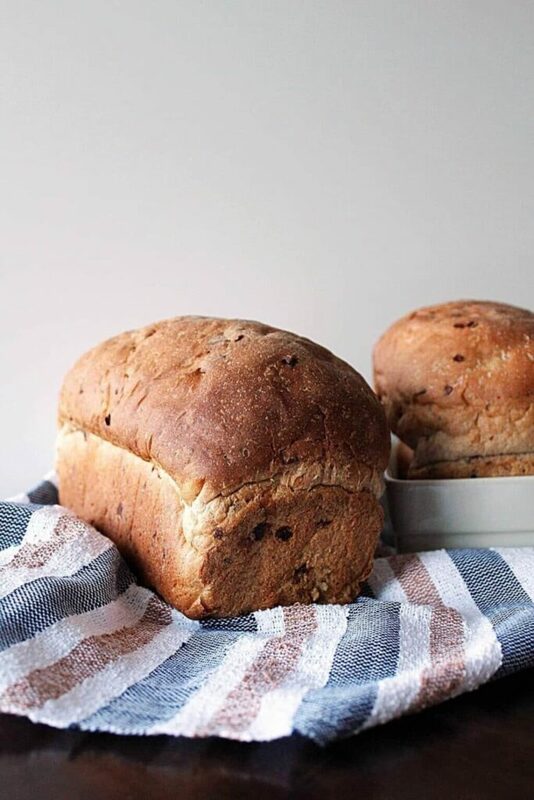 Do keep an eye on the texture of your bread while it’s mixing – that will give you the best determination if you need more water or to add a little more flour. This bread can be made in your stand mixer as well, no problem. Just be sure to kneed well and follow the two rise cycles! Add ingredients to bread maker as listed starting with the lesser amount of water - choose sweet bread cycle to bake in machine or dough cycle to bake in oven. If baking in machine, set machine and check back to see if you need additional water! If baking in oven, remove dough from bread machine after dough cycle has completed, and turn out onto a floured surface. Punch down the bread and shape into logs sized for bread pan. Transfer shaped logs into greased loaf pans, cover with a tea towel and place in a warm place to rise for 45 minutes. At the end of the rise cycle, bake in oven at 375f for 35-40 minutes, covering the bread loosely with tinfoil if the crust darkens too rapidly. Remove bread from oven or bread machine, and turn out onto a spread tea towel. Allow to cool for 20 or so minutes, before covering with another tea towel. Cool until room temperature before placing in storage bags. This is a 2lb loaf recipe. It should work in most bread makers! DO NOT attempt this recipe if your bread machine can't handle 2.5lb loaves of bread - that is a disaster waiting to happen! Previous Post: « What Is Curcumin?